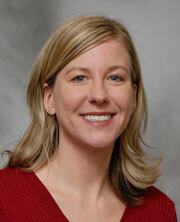 Dr. Thompson is an Assistant Professor of Medicine and is board certified in Internal Medicine. Dr. Thompson earned a bachelor's degree in Biology from Hamline University. She went on to complete both medical school and residency at the University of Minnesota. She also served as Chief Resident in Internal Medicine at the University of Minnesota in 2001-2002 and currently serves as an Associate Program Director for the Internal Medicine Residency. Her academic interests include patient safety and medical errors, and developing the educational skills of residents. Her patient related interests include women's health, preventive medicine, and also consultative general medicine (the "second opinion" workup.) She endorses a philosophy of using diet, exercise, and other modalities before resorting to the use of medication or invasive procedures to promote health. Zapzalka DM, Thompson HA, Borowsky SS, Coleman-Steenson CC, Mahowald ML, O'Connell KJ. Polyarteritis nodosa presenting as spontaneous bilateral perinephric hemorrhage: management with selective arterial embolization. Journal of Urology 164 (4):1294-5, Oct 2000. Thompson HA, Burson JM, Lang JA, Gross KW, Sigmund CD. Tissue-specific expression of novel messenger ribonucleic acids cloned form a renin-expressing kidney tumor cell line (As4.1). Endocrinology 136 (7):3037-45, July 1995. Thompson HA. "Paroxsymal Nocturnal Hemoglobinuria Presenting as FUO in a patient with Myelodysplastic Syndrome." ACP Clinical Vignette Abstracts, Minnesota Chapter Meeting, Fall 2000. Thompson HA. "Thyrotoxic Periodic Paralysis in a Young Hispanic Male." ACP Clinical. Vignette Abstracts, Minnesota Chapter Meeting, Fall 1999.